· Bar weights – Bar weights can make a big improvment in vibration through the bars. Most Virago’s do not have this problem, but if you have a vertical twin, and the handlebar vibration bothers you, you might want to try bar weights, preferably over 5.0 ounces or 142 grams each. See the bottom of this page for examples of bar weights. If you have questions on jets or carburetors, go to the Virago Tech website – they really know this stuff. · Carburetor joint, plastic is cracked – do I need to replace ? – Maybe not. Check it while spraying something on it while the engine is running. If the engine speed changes, carb joint needs to be replaced. On my 2002 Virago 250, the carb joint is cracked, but it does not need to be replaced. · Chain , adjust tension – Chain slack should be between 1.2 inches and 1.6 inches (30 to 40mm). Check with driver sitting on seat, bike not on stand. · Fast bike – Virago 250 – how do I get it ? This is what worked for me: 1) Check tires often (it can make a huge difference in performance) 2) Pilot screw adjustment 3/4 to one turn out, 3) removing parts for weight reduction (40 lbs so far), 4) lost 10 lbs myself, 5) O-ring chain, 6) iridium plugs, and 7) new, larger air filter. · Speedometer – is it accurate ? (Virago 250) Mine has the stock size front tire and is typical (indicated x 93.21 %) – indicated 70 mph is actually 65 mph, 60 is 56, and 55 is 51. Owners who have switched to a larger front tire say it makes the speedometer pretty close to accurate. · Top Speed – Virago 250 – Official top speed is always on level ground with no effect of wind. Official top speed of the Virago 250 is 85 mph. Going downhill with a tailwind people have gotten very close to 100 mph, but that is not “top speed”. My own bike has 17/39 sprockets and would do 98 mph downhill (8,400 rpm) with a tailwind. Trivia/physics – compared to a lighter rider on the same bike, a heavier rider would have a lower top speed going uphill, the same top speed on the level (but would take longer to reach it), and a higher top speed going downhill. After a 90 minute commute in hot weather, my Virago 250 voltage regulator will burn you, so it must be over 120° F (46.9° C). If your Virago 250 voltage regulator is running too hot, a temporary way to help until you can get it checked-out is to run more lighting (such as incandescent spot lights – not LED) so the regulator will not need to absorb quite as much current. Drilling holes in the front edge of the side cover or just leaving the side cover off might help, also. · Whitewalls, white – You can get whitewall inserts for $30 per pair at Mooneyes.com. The width available for 15″ and 18″ is 7/8 inch or 22 mm (so they are not as wide as “gangster” whitewalls). The picture has a mock-up of these so you can see the width (they look wider up close). Bar weights – Bar weights can make a big improvment in vibration through the bars. If you have a vertical twin, and the handlebar vibration bothers you, you might want to try bar weights, preferably over 5.0 ounces or 142 grams each. Hi, have you ever come across these virago’s getting oil in the frames? 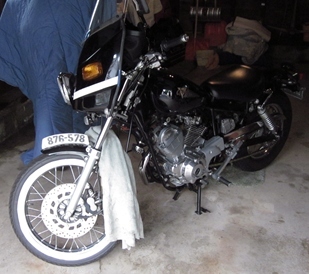 Yes – oil in the Virago 250 frame almost always comes from the air cleaner. The stock air filter is foam, so it needs to be oiled. It you use too much oil or the wrong kind, it can go into the frame. If your air filter is in good shape, you can just clean it and re-oil it (use oil made for foam air filters). If the foam has gone bad (this is common) find the paper air filter mod on the Virago Tech.com website (post is “Air Cleaner Stuff” – http://viragotechforum.com/viewtopic.php?f=6&t=30147). This is a great mod, it is easy to do, and the element is easy to find. If you do keep your foam filter, make sure to use the oil made for foam air filters (not the oil for paper K&N filters – it is different). It is real sticky and stays on the foam instead of flying off like regular motor oil. I used motor oil for mine (I’m cheap) and it got on my engine and my clothes. For Fuel Line and Vacuum Line routing, please hit this link. The diagraph is near the middle of the posting. can anyone please tell me how to fix the speedo. it is often inaccurate, the pointer oscillates a lot, apart from getting stuck at 40 km/h and wont go down to zero. A speedo is hard to fix, but maybe your problem is the cable. Make sure the cable is straight and not kinked. Remove the inside part of the cable and grease it except for the top 75 mm or so. In other words, don’t get any grease on the last approx 75 mm before it attaches to the speedometer. Whoever started this website/blog, THANK YOU. i have a 250 Virago and could not get a manual with technical details. It is all here. Wonderful.